With Norwegian Airlines rapid expansion of longhaul low-cost flights, other airlines are starting to enter the market and compete in this fast growing sector. The premise of just paying for a basic fare and then having flexibility to add extra services you need, such as a checked bag or food and drink onboard, has proven popular with customers who don’t want to pay for the full service traditional airlines offer. The latest airline to launch this basic long-haul product is LEVEL. Part of the IAG group and sister airline to British Airways, Iberia, Vueling and Aer Lingus, LEVEL currently offers flights from Barcelona to 4 destinations; Oakland (San Francisco Bay), Los Angeles, Punta Cana and Buenos Aires. With over 1 million visits to its website, 60,000 followers on social media and over 130,000 tickets sold since its launch (correct at July 25th) we were interested in what exactly is on offer, is it actually cheaper, what customers have experienced and would we consider trying it out? Lets start with what exactly what is on offer. The airline has brand new A330 aircraft which only have two cabins on offer, Economy and Premium Economy. Irrespective of the cabin you are in or the fare type you choose, all customers will have access to onboard WIFI (with a charge to use it starting at €8.99), a personal TV, a piece of hand luggage and the ability to redeem and accrue Avios points. Customers then have the choice to either stick with the basic offering and pay the lowest price or add extras either individually or as part of a fare bundle. There are 4 different Economy fare bundles which, as well as adding a combination of checked baggage, seat selection, emergency exit seats and a hot meal onboard, also add flexibility options such as changing or cancelling the booking. Once you are onboard, you can purchase food, drink, WIFI and a ‘comfort pack’ which includes a blanket, pillow and amenity kit. Premium Economy seats offer a seat pitch of 37”, include a 3-course meal, drinks and snacks, a larger personal TV with noise cancelling earphones and 2 checked in bags. The website inflightfeed.com reviews food onboard flights and whilst they haven’t reviewed LEVEL yet (we’ll keep an eye out and update you when they do) they do give some insight in to the ‘Special meal’ options which include Asian vegetarian meal, Infant, Child, Diabetic, Gluten Free, Indian, Kosher, Low Calorie, Low Fat/Cholesterol, Low Salt, Halal, Without Milk Products, Vegetarian, Vegetarian without Milk Products (all need to be pre-booked and paid for). The website focuses mostly on the various fare options and costs so there isn’t any insight in to the customer service offered. It does clearly state that they do not accept stretchers but for all other T&C’s and customer service policies you are referred to the Iberia website. LEVEL launched with advertising that boasted €99 one-way fares so we did some spot checks to see if we could find any of these fares and to see how the fares compare to its direct competition, Norwegian, and full-service sister airline British Airways. N.B. To take advantage of the LEVEL flights you’ll need to fly to Barcelona first so we have added £150 to the cost of the LEVEL flights to cover this cost. In our spot check, LEVEL comes in more expensive than Norwegian but still significantly cheaper than BA. We couldn’t find any of the €99 fares and that could be because they have all been sold or it could be that the very basic search function means the very cheap fares are not easily found. On the plus side, customers can book flights through Iberia and Vueling to Barcelona which connect onto LEVEL’s network with a single ticket. In comparison to LEVEL’s basic website, Norwegian’s website offers a facility to select travel dates and budget and they will show you flights available within their 119 destinations which is very user friendly and hopefully something LEVEL will develop over time. It’s very early days for the brand new airline, even if it is part of the large IAG group, and feedback online is mixed so far. The themes in the feedback are that the new modern aircraft, entertainment system and cabin crew are excellent but that the ground service is disorganised and punctuality isn’t as good as expected. With only a few months in operation this is probably to be expected but as they start to expand, it remains to be seen if their ground operation and customer service will match their onboard product. It’s worth noting that a number of customers have said they would recommend upgrading to Premium Economy as it is still cheaper than other full service airlines but the inclusive food and drink, extra leg room and 2 free checked in bags is worth the slightly higher price. Some customers have reported being given the options to upgrade for €150 when they check in which could be a brilliant opportunity, although it is a gamble as to whether there is availability. So, would we fly with them? 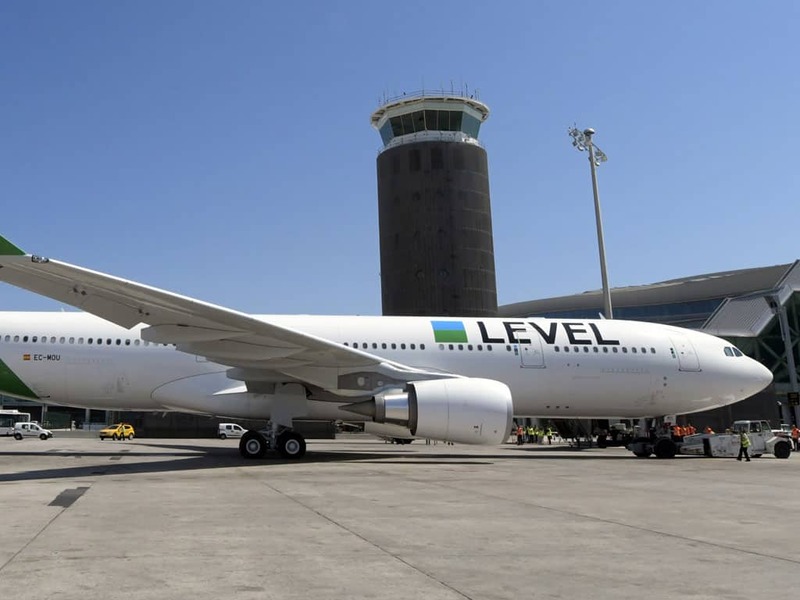 Overall, it’s clear that LEVEL’s entry to the market has been strong and the prices they are offering are similar to Norwegian and significantly lower than the full service airlines. The pricing is very clearly explained and I think most customers would buy a ticket knowing what they will or won’t be getting onboard. Whilst LEVEL doesn’t offer the range of destinations and frequency that Norwegian has, they have said that by 2018 they are going to increase the fleet to five aircraft and their big selling point is that you can connect on to flights in the wider IAG group, opening up over 380 destinations. They have also launched a codeshare agreement with American Airlines on flights between Barcelona and the US which gives even more options for customers. The website needs improving and the reports of disorganisation at the airport and delays are worrying but will hopefully be resolved as they embed new processes and quickly learn from experience. On balance, yes, we would give them a try. The opportunity to fly in Premium Economy, enjoy extra leg room, and two checked bags for the same cost (or less) as Economy on a full service airline is enticing. To use them to repatriate a customer they could offer a good link in to central Europe at a lower cost however the frequency and small number of destinations might mean it is difficult to find appropriate options. There is no information on whether they would provide oxygen and carrying additional equipment could come at a prohibitive cost. They explicitly state on their website that they don’t accept stretchers and there is no Business Class so it would only be appropriate for customers who were able to have extra seats (the A330’s have a 2-4-2 seat configuration) or didn’t need additional space.